Measuring the "success" of podcasting in education is a slippery slope. However, at Sierra College we have a clear indication that podcasting is in demand! Last spring I began facilitating a series of trainings for faculty and staff titled "Audio Development" in our new iTech Lab. The workshop is 18-hours long (it meets 4 times for 4 hours sessions plus 2 hours of outside work) and participants leave with the ability to record and edit audio files with Audacity, create mp3 files and upload them into their very own podcast on our brand new iTunes U site. Our iTunes U site received its first trickling of downloads during our Summer 08 session and this fall things have really picked up. In addition to training nearly 40 faculty members on podcasting, our distance learning staff is rigorously recording and converting all our live television classes into video podcasts. The result? Well, we were anxious to identify whether or not our students would bite. Despite the fact that our site has not been advertised at all and despite the fact that we don't even have a prime time spot in the "iTunes U" section of iTunes, there have been over 3,600 downloads in just four weeks. Amazing! Last week I presented to our Associated Students of Sierra College and showcased our site in addition to the innovative podcasts Broome Community College is putting together. The Sierra students loved Broome's reality show concept titled "On The Quad" and their "Campus Life" podcast generated loads of ideas. One student commented, "This is better than YouTube!" So, how will this alter the landscape of higher ed? Well, in lots of ways. First, if you've already completed your college education, imagine all those days you sat in a lecture hall intently following your professor's every motion, gesture and word. Despite your best efforts, you always had lingering questions, right? Even though your professor was considerate enough to periodically ask, "Any questions?" were you even confident enough to say, "Yes, could you repeat that five more times?" I know I never said that even when I desperately needed the repetition. If classroom sessions are recorded and offered as podcasts, students can review over and over and over again ... and take it with them to the gym on their iPod! Or how about our ESL students? Imagine how success will improve for them with podcasting. Of course, let us not forget our online students who have been learning for years without hearing the personal voice of their professor. That too is changing with podcasting. But what really excites me is the potential for iTunes U to extend a sense of our campus community to our online students who never come to campus (and comprise more than 10% of Sierra's FTES)! Imagine offering podcasts of student success workshops, club events around campus, welcome messages from campus leaders, panel discussions with faculty members and guest speakers? 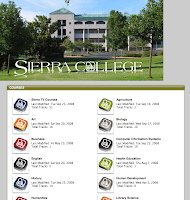 No longer will they only have the cold stare of a Blackboard log-in page as their "welcome" to Sierra College. Check out Sierra College on iTunes U!